Back in the old days before I took a break from blogging, I had a healthy list of blogs I read on a regular basis. Sadly many of them are gone for various reasons. 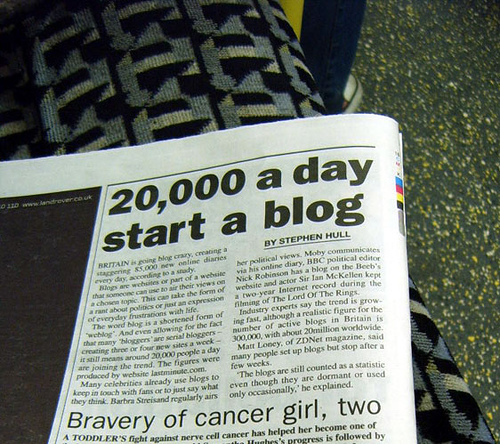 I read once that the average lifespan of a blog is two years, so I guess I shouldn’t be surprised. Since then I’ve stumbled on and become a regular reader of several blogs, but I’m looking for more. I’m looking for some blog recommendations. What I’m looking for, specifically, are blog recommendations for bipolar, depression or blogs that focus on mental health in general. However, if you know of any “must read” blogs that aren’t related to mental health, I’m open to hearing about those too, especially if they are humor blogs. I’m depending on all of you other bloggers and blog readers out there to help me out. I look forward to reading your recommendations. It’s good to be back and good to reconnect with you, Laura. I have you on my WordPress Reader now so I won’t lose track of you. Here are a few more as promised. Enjoy. Thank you, Rose, I’ll check them out. I’ll have to look through my list but most of the blogs I read are the same one’s Kat has listed. Kat has a good list, but if you think of others please let me know. Thank you for stopping by. Two years? Most people I know don’t make it past a week, ha ha. I guess those of us that keep going for years sort of skew the numbers; my Livejournal is almost 13 years old and still going, and the (now) bipolar one is 3 and a half years. I’ll let you know as I come up with more. top ten list for the day is a good one, interesting and sometimes funny and usually unusual. there are probably more, but im too tired to look on my reader! That’s okay, kat, since I know you have incredible taste (you read this blog) I’m going to head over to the list you have on your blog and check them out.